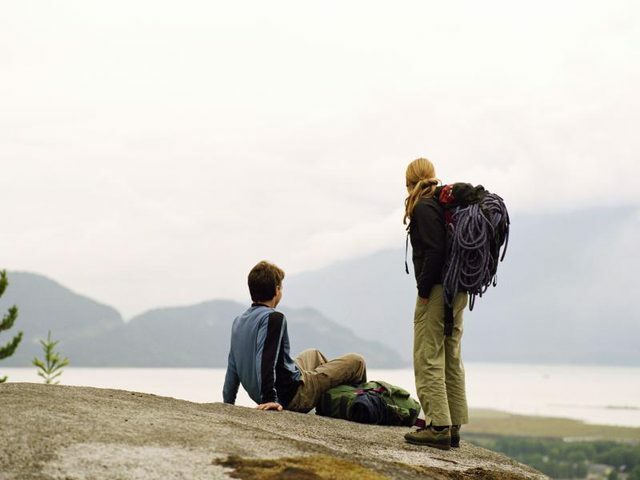 When deciding to go on a hiking adventure it is important to make sure that your body is as prepared as it can be and the right training regime. We just need to think about what it is all about, carry a backpack over a long distance. It all adds up to needing to exercise legs & shoulders to bare the weight of the pack. Whether you are an avid fitness junky or if you are just starting to consider exercising and changing your life, you must need a plan that you need to adhere to. As these muscle groups are alternating you can either train each group on separate days or you can combine them into a singular workout. Need to be mindful when planning to include a day or two for rest. There is no point overloading your body especially when you are first starting out. It is almost a guaranteed way to get an injury and to set back any training benefits you have earned. Things To Consider When Starting Your Training? You may be thinking why would I need to consider anything? Can’t I just starting the exercises. We need to be mindful of the exercises we perform and how to make sure that they are done correct and we minimise the risk of injury. So it would be handy before attempting any of these exercises that you look over our article on warm ups. Items you might want to use hand weights, resistance bands or soup cans. Strange as it may seem but soup cans will provide a nice starting point if you don’t want to invest in potentially expensive equipment. The beauty of these exercises is that you can do these anytime and anywhere, with proper gym equipment or with items just lying around your home. This exercise will help strengthen your legs, glutes & help brace your core muscles. Start – Find an empty space which you can lay down a mat or on a carpeted surface. Exercise – Lie faceup, arms out to your sides at 45-degree angles, left foot flat on the floor with that knee bent, and your right leg straight. Raise your right leg until it’s in line with your left thigh. Then squeeze your glutes and push your hips up—your lower back will elevate. Pause, and return to the starting position. Another exercise to help provide strength and control of your leg muscles. It focuses upon upper legs, glutes & core muscles used for stability. Start – Everyone will have a different range of motion, but it is essential to make sure that you can keep your balance. If you aren’t comfortable with your balance you can use a broom stick to provide assistance when performing this exercise. Exercise – Stand with your feet hip-width apart, hands on hips. Keep your chest and eyes up, shoulders squared. Cross your right leg behind your left, and bend both knees, lowering your body until your left thigh is nearly parallel to the floor. Return to start and repeat, switching sides. This exercise will help work the muscles of your upper legs and glutes. These muscles are instrumental in shaping and strengthening your legs and buttocks. I recommend using a light weight for this exercise, from two to five kilos. Start- Great exercise that can be done anywhere, firstly you need to find a step or a block. If using a block make sure that the height of the block isn’t too large. 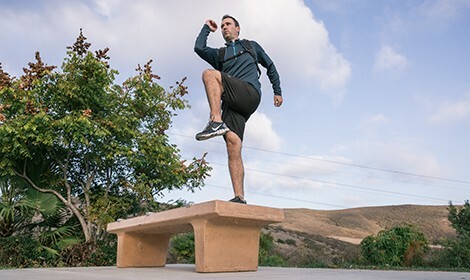 Exercise – The exercise is as simple as stepping one leg up onto the step or block, then step your other leg so that you are at the highest point of the exercise. Then step down in the same order. Repeat this for at least 30 seconds, try alternating the legs stepping up for the first time. Start- Perform this exercise either stationary going forward or backwards, or alternatively do as a walking lunge for about 10 meters. Provide an additional challenge by holding some weight in both hands. Exercise – Step forward with one leg and drop down until your knee is approx. 4 inches from the ground. Then step your leg back up to meet the first leg standing upright. Then step forward with your other leg and continue for at least 30 seconds. If you are attempting the forward walking lunge do the same but traverse in a straight line. Tip: if you only have 1 weight pass the weight from side to side between your legs for an extra challenge. This exercise will help work the muscles of your upper back and shoulders. These muscles are instrumental in raising your arm in overhead movements. I recommend using a light weight for this exercise, from two to five kilos. 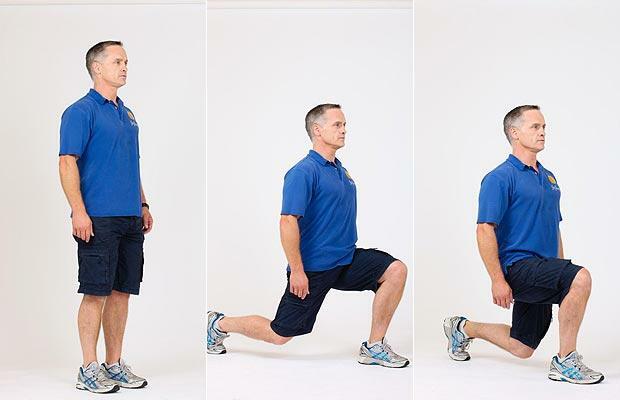 Start – Stand with your feet about hip-width apart, with relaxed knees (your “relaxed stance”). Hold a single dumbbell in your hand. Place your thumb-side against your thigh. Exercise – Lift your arm up and out at about a 45-degree angle from your body, pointing your thumb-side down toward the ground as you lift. Think of pouring out a can of soda. Keep your wrist firm (don’t bend it as you exercise). Lift up to shoulder height, pause for a second or two, and then return to the starting position. Tip: Don’t have a small weight at home? Use an actual can of soup or a filled water jug with a handle. This is a good exercise for the rotator cuff, one of the shoulder’s potential trouble spots. 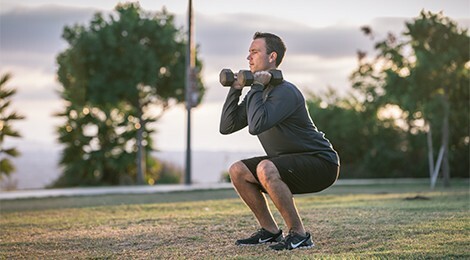 Start – Start in your “relaxed stance” as mentioned earlier. Place a light dumbbell in one hand and place that hand, palm down, on the opposite thigh (for example, put the thumb of your right hand on your left thigh). Alternative you can use a resistance band as shown in the image above. Keep your arm straight throughout this exercise. Exercise – Draw your arm across your body (out and up to above your opposite shoulder). Once your hand has reached a level above your shoulder, return to your starting position. Perform this exercise slowly. Complete 12 repetitions, and make sure you switch arms. Good exercise to help build your shoulders and external rotator cuffs. Even though this exercise is for shoulder you can incorporate your legs by squatting before the push press. Start- Find a place where you can comfortably extend your arms above you hard straight. Use either hand weights, resistance bands or cans. Exercise – Place your hands shoulder width apart level with your ears. Push your hands directly up keeping them inline with your shoulders. We want you to keep your hands separated at the top of the movement. Repeat for 12 repetitions. Fantastic exercise to help build your traps which are indicated in the image above. 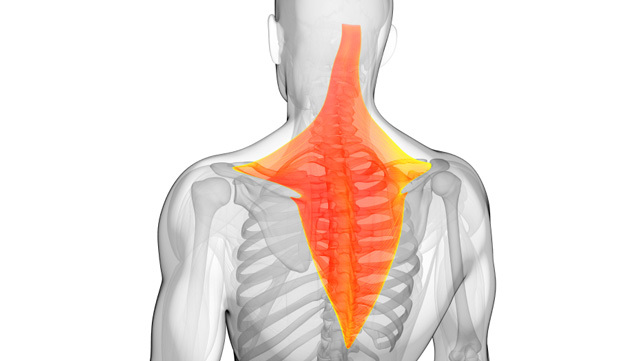 The trapezoid muscles extend across the top of the shoulders but are mainly focused centrally around the neck. Start- You can perform this exercise with any weight in each hand, a great alternative is filling up old shopping bags with cans of soup making this exercise easy to do at home. Exercise – While holding your weights next to your body lift your shoulders up towards your ear. Hold the weight at the top for at least 2 seconds, repeat for 12 repetitions. For additional fitness articles or alternative exercises please view all articles here.